When Alessandro Volta, the Italian inventor who invented the battery back in the year 1800 did it, the main idea was to store energy for use in future (Zhou, Naim and Wang 2007, p. 58). Despite the initial idea, the nature of the battery has not quite changed that much. In most cases, lead-acid batteries are used in vehicles and other automobiles while household batteries make use of Zinc Manganese batteries (p. 59). These batteries do have some harmful chemicals that are contained in them. The mains purpose of this research is to try and evaluate the extent to which disposal of batteries is done and the kind of challenges / problems that this brings on both the environment and more specifically on humans. The report will also seek information about the problems that are also faced in other regions like in China and the US. The way in which people utilize their batteries as well as the ways in which they use while charging their batteries also matters since these factors affect the battery life (Potter 2005, p. 15). For example, if an individual or multiple cell (s) are broken, the cell may not function properly leading to reduction in cell life. Talking in general terms, batteries are made up of materials that have been found to be toxic to both the environment and humans too. This does not exclude the animals within as the same substances also affect them. Batteries are made using lead (Miller 2004, p. 91), nickel, lithium, manganese, mercury, cadmium, zinc and a host of other corrosive electrolytes (Zhou, Naim and Wang 2007, p. 58). According to a report on hi-tech gadgets dabbed Beware of pollution from hi-tech gadgets (2002), it is found that platinum contains different poisons that are in the battery including lead and heavy metals like mercury that are immense pollutants to the environment at large (p. 1). In addition to this, the corrosive materials / electrolytes that are used in the lead-acid batteries have been found to affect the environment to a great deal since it is mostly made up of dilute sulphuric acid (Miller 2004, p. 91). A combination of these materials shows, just as seen in Recycling key to toxic waste management (1996, p. 34), the most effective way to deal with the menace is to recycle the materials. Recycling reduces the need to extract more virgin materials to address the same problem since there is continued reuse of previous materials that would have otherwise been disposed (Recycling key to toxic waste management 1996, p. 34). In a report on Recycling key to toxic waste management (1996, p. 34), it is noted that plastics, acid and lead are in most cases poorly discarded, which is mostly on open fields. In so doing, there is disregard of environmental and health hazards (Beware of pollution from hi-tech gadgets 2002, p. 1). When lead is exposed in small chunks to small children (mainly those below the age of six years) and foetuses, it has been seen that there are adverse effects that happen to them. To start with, there is a recorded decrease in the level of IQ in the children that is later manifested in their studies (Sigman 1995, p. 456). A good example is shown in the research by Sigman (1995) where they record the number of school dropouts in relation to the exposure to these chemicals and the figures are alarmingly high as noted in the research (p. 456). The second notable effect is that there is reduction in reaction time that is recorded in such children which continues on to their adulthood (Sigman 1995, p. 456). Evidence has shown that exposure of humans to mercury raises the risk as well as propagates the damaging of the central nervous system as noted by Zhou, Naim and Wang (2007, p. 58). Cadmium on the other hand has been found to poison the human blood stream slowly until it reaches a lethal point when it will have damaged most of the vital organs and can be fatal too (Zhou, Naim and Wang 2007, p. 58). To be able to detect an exposure to these harmful substances, patients develop pulmonary emphysema, Anaemia, paralysis and weakened bones (p. 58). Lead is among the most lethal of them all since once injected/ induced into the body, it can hardly be excreted from the body (Zhou, Naim and Wang 2007, p. 58). This means that it continues to stay in the body for as long as one lives destroying organs like the reproductive system and the kidney (Zhou, Naim and Wang 2007, p. 58). The source of damage of a battery is mostly in its charging. This is so because, batteries ought not to be charged while hotter than room temperature as this would lead to overheating that can result to explosion thus causing physical and psychological injury/ trauma (Potter 2005, p. 14 +). As a result of this, a charged battery that is not in use will loss 20-25 % of its charge within the first 24 hours (Potter 2005, p. 14). After that, another 7-10 % of the charge will be lost in the consecutive 24 hours after the first 24 hours while the remaining charge will be lost at the rate of 1 % per day from the third day (Potter 2005, p. 14). In Zhou, Naim and Wang (2007, p. 58), it is noted that one large battery has the potential of rendering a one meter square piece of land permanently unusable (Markus 2002). Using the same chemicals from batteries, research has also shown that a button of the same cell battery is capable of polluting as much as 600 tons of water that can be equated to the similar amount of water that an ordinary human being consumes in a lifetime (Tao 2002; Zhou, Naim and Wang 2007, p. 58). Industrial batteries have a usability life of 10-20 years while the battery of a truck can last for as long as 3 years (Miller 2004, p. 91). A car’s battery can last for 4 years and it has a weight of 21.4 pounds (Miller 2004, p. 91). Of all the lead produced in America, 80 % of it is used in battery production while research has shown that production of virgin lead can be less costly compared to recycled lead (Sigman 1995, p. 459). This is so because of the costs incurred in collecting used batteries from consumers around the country and beyond to extract the recyclable materials. The amount of lead that is recycled in China is less than 2 % while Germany remains to be the leading in recycling of batteries and its parts in the world. To be able to salvage a dying battery, it is possible, if the battery cells have not died, to stabilize the battery for longer service. This can be achieved by charging the battery through Equalization and Maintenance Modes (Potter 2005, p. 14). Miller (2004) raises a red flag when it comes to incineration of batteries claiming that there is wastage of resources that are scarce and that incineration does not quite solve the problem but rather magnifies it (p. 91). For example, when sulphuric acid is ‘burnt’, there is emission of sulphur dioxide into the atmosphere that combines with water vapour to form sulphuric acid and sulphurous acids that are corrosive to most metallic surfaces like iron roofing and damage the plants (Ma 2003; Zhou, Naim and Wang 2007, p. 59). The materials that are used in the batteries can be recycled. For example, the plastics casings are made of polypropylene and they can be reprocessed to form new casings (Miller 2004, p. 91). Lead on the other hand can be melted and reformed to make lead plates and a number of other battery parts as argued by Miller (2004, p. 91). 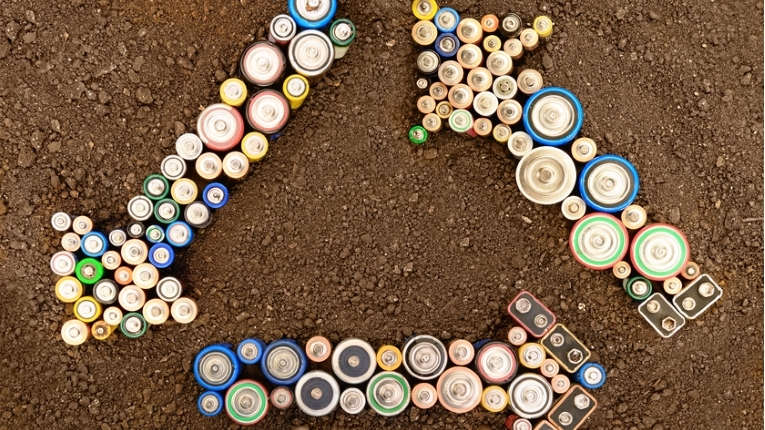 In the United States, research has shown that lead-acid batteries are the most recycled materials since the introduction of stringent standards pertaining health and environment (Recycling key to toxic waste management 1996, p. 35). Battery acid does utilize sodium sulfate which when improperly disposed can react with appropriate materials within the environ to form hydrogen sulphide which is a highly dangerous and odorless gas that can kill in minutes. To dispose this, the acid has to be neutralized first so that wherever this shall be poured; it shall not have adverse effects on the environment. A good recycling international company is DEWALT that actively participates with Rechargeable Battery Recycling Corporation (RBRC) and they specialize in recycling NiCad cells (Potter 2005, p. 15). Most of the batteries are sold and/ or disposed off to scrap battery dealers and ‘breakers’ who smelt them and remold them or resell them to other interested parties (Sigman 1995, p. 455). In conclusion, it is evident that there are many challenges that are posed by improper disposal of batteries. In this research, there have been focuses on the underlying effect that are and/ or may be brought about by exposures to the harmful materials that are used to make batteries. By understanding these dangers, it is then possible for people to make informed decisions concerning the modes that they have been using to dispose off batteries. The discussion indicates that despite their hazardous nature, it is possible to re-utilize them to extent their service life if properly recycled thus reducing the need to mine for more resources especially those, which are rare like lead and mercury. This means that there is preservation of mines and resources for future generations. While the metallic and the plastic parts can be recycled, the liquid electrolytic part can hardly be recycled and hence requires neutralization to eliminate the corrosive factor for proper disposal. Due to the nature of the research, the learner recommends immense education to members of the public as far as battery usage, charging, disposal and recycling is concerned. There ought to be stringent policies that are capable of coercing people and organizations to come up with alternative means of storing energy that are both environmentally friendly and efficient in energy delivery. Bridging the gap that exists between the consumers who uses the battery as argued by Tsoulfas et al. (2002; Zhou, Naim and Wang 2007 p. 64), and the recycling plant by including the retainers as key players in collection of used batteries would help a great deal in improving the amount of recycled batteries. Battery incineration should be a thing of the past when there is increased efficiency in recycling. There should also be proposition of zero-mercury batteries for researchers to be able to bridge the gap that exist between research and practice. As mentioned in Donnelly (2002), there should be consideration of human health, animal health, conservation of land, water and air from pollution to make this world a habitable place (p. 33).